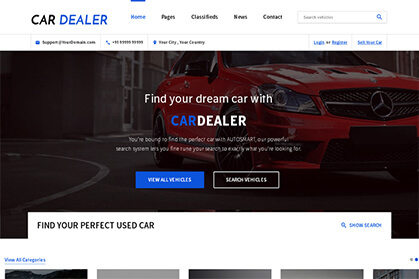 This auto classifieds script allows you to search for cars that you wish to buy, sell or rent. You can use this script for all the automobiles with a little customization; it is not just restricted to cars. This is the leading market place business that helps start-up entrepreneurs. This car listing script has a multi-language support with more than 120 unique features. It has a user-friendly design, easy to navigate interface. This script is developed with SEO-friendly architecture and coding style in accordance with Google standards. We offer this script with all content, design and images, as soon as you pay we will live your website within 48 hours. Title shows in which year the car was used. View all photos of each car. Price and contact number can be displayed for each cars. Book car by clicking the book now button. More details option that to know the detailed description of the car. The users can search any kind of make, model, and price and color of the vehicle by using the keyword search tool. You can even search within the filters. This used car dealer script allows your website visitors to easily filter vehicles by allowing them to multi-select makes, models, features, pricing and more. Our car listing script is user friendly, fully functional and easy to use, flexible and allows new fields for the different vehicle types to be added from the admin panel, so the car dealer is free to add the new fields. When a car rental agent or seller wish to list his cars for sell or rent, you can charge a small pricing per listing, or charge them yearly fees for using the site by membership package as per below. In the event of the buyer wishing to rent the car or buy the property, you can charge a small percentage of success fees from agent. Paid per Impression Ads / Google AdSense. Earn money with Paid Car Insurance Adverts on banners and sidebars. Awesome Theme and Awesome Customer Support!!!! You can purchase this script and you will easy to install and user friendly. This car listing script gave me all the databases to run my website very easily. The built-in features are really wonderful making this script looks good. I earn so much from his script with a little investment only. This script is affordable too and decent enough. Great work!!! They have unique design and functionalities. These scripts having lot of unique features like filtering the car models, price and reviews checking. Their customer service is absolutely best and also proud.